justthefood.com...the blog: FOUND: A Mo Betta Chedda! FOUND: A Mo Betta Chedda! After much investigation, some tasty (and some quite disgusting) I am finally ready to post my results for the best tasting vegan cheddar alternative. I tested each cheddar in 3 categories. Cold, as is, right out of the package, on a cracker. Meltability and stretch, on pizza. Mixability and creaminess, in macaroni and cheese. 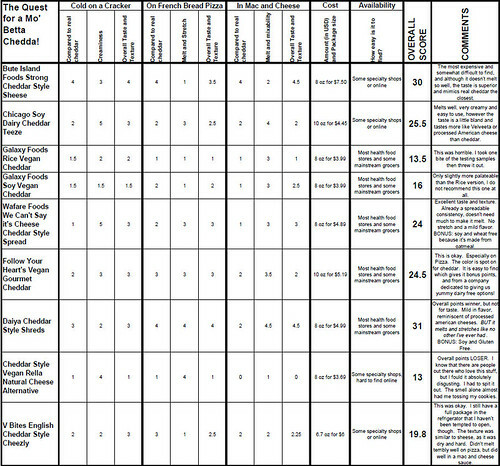 Each cheese was scored on taste compared to "real" cheddar, creaminess, and overall taste and texture, and I also gave info on availability and cost. Scores were based on a scale of 1 to 5, 5 being the best. In addition to the results above, I will add that I most commonly buy Daiya, Wayfare, and Sheese. Once testing was over, I threw away the Vegan Rella, Rice Vegan and Soy Vegan. I would never, ever, ever buy those again. I'd rather just go without, or make my own from scratch. 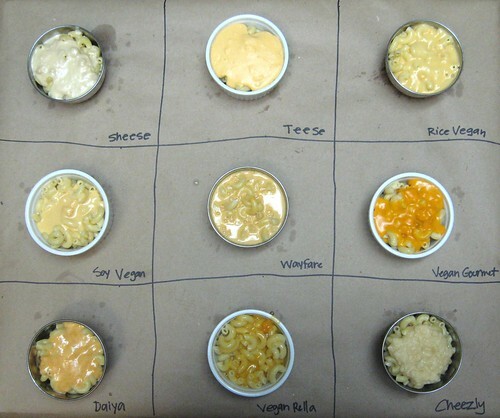 And to be fair, the best mac and cheese (using fake cheese) was made last night using the leftover Daiya, Teese, Sheese, Vegan Gourmet, plus Tofutti Sour Cream, Tofutti Cream Cheese, Silk Creamer, and Earth Balance. I know, ridiculous. I did it in the name of research. I would also like to add, as I did before, that I was only testing CHEDDAR flavors, and, in my opinion, the best imitation cheeses out there are not cheddar replacers...Dr. Cow (any flavor), Sheese Blue Cheese, Wayfare Hickory Smoked Spread, and any of the nut based home made cheeses out there blow all of these out of the water! What a cool posting. This is SO helpful to me!! The best vegan cheese I've ever had is from Ste Martaen in Chicago. They don't have cheddar, but they do have colby, smoked Gouda, pepper jack, muenster, and olive and they're all DELICIOUS! What an awesome and creative review! I will be using it as a guide for my vegan cooking and baking. I love Sheese! 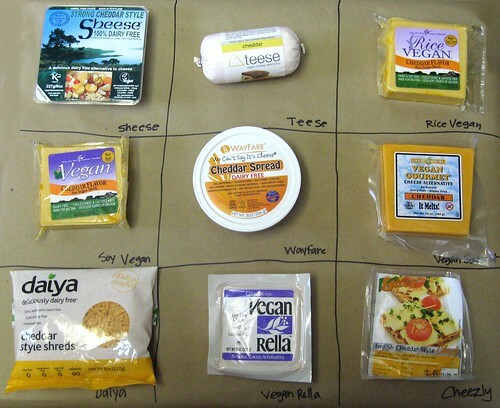 I did a review of Sheese on my blog few weeks ago http://czechvegan.blogspot.com/2010/11/amazing-vegan-cheese-sheese-review.html I also like Daiya for baking. Thanks for the review it will save me money on buying some crappy vegan cheese. That's a thorough review! The three you chucked are the 3 I avoid like the plague. I know it's not cheddar, but I had also avoided tofutti in the past, then tried the american. Tastes just like regular "cheese food" singles, so weirdly good if you're going for a processed american cheese taste. Very thorough research! Thanks for sharing. This is good to know (and share with others). I returned teese to whole foods for a refund. nasty stuff. Sweet baby jesus, learn how to create a table instead of using an image! So awesome! I had planned to do this will all of the sheese flavours but then tasted them and discovered that I hate all of the sheese flavours, I think it tastes like alcohol. 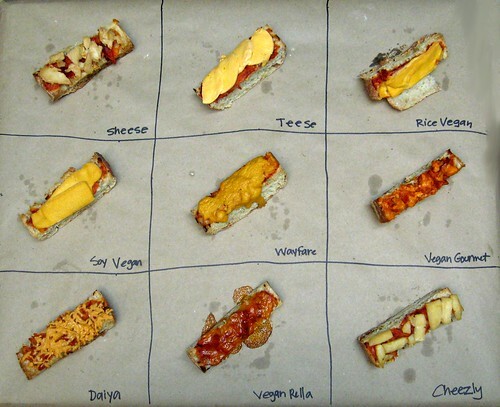 My all time fav vegan cheese is cheezly, but we don't get many here in Australia. It isn't often that I come across good vegan food sites. I am glad to have stumbled across this one. wow, amazing post!! So happy you did this piece. Really informative! I have yet to try Sheese, and now am dying to get my hands on their blue cheese. Thanks for this! I so totally meant to do this a year or so ago. Problem is I have to either mail order some of these brands or travel south outta Canada to get them. Makes it hard to get them all in one shot in the same time, like you did. You came to the same conclusions I did - especially about the rice vegan cheddar - a well meaning coworker once bought it for me and said she actually liked it. Horrible isn't even the word for it. What a great and useful post! I will have to try the highly rated ones. I have already tried and like daiya. I want to try them all to find my own personal fave but was overwelmed with the choices. Now I know where to start. Thanks! So helpful and useful! Thank you for doing that! Now I need to find the choices you liked. I don't think I have seen them before, but I will search more carefully now. Very nice. Thank you so much for this information! I rarely ever use a cheese substitute, and when I do, I've mostly been unhappy. Now I'll know which to just not bother with! I think Scheese is totally disgusting - I even wrote to them about it. Absolutely vile stuff I thought! Vegan Rella is also foul. To be honest everything I've made from the ultimate uncheese cookbook tastes so much better unless I really need a solid cheese rather than a sauce or melty type thing I would alway make it myself. By the way the gourmet does not look most like cheddar - cheddar is never, ever orange! Commercial vegan cheese is in the main a very poor tasting, and unmelting product not worth bothering about. How did I miss this post! Fantastic! I can't wait to try these other ones. You made my job easier. I have dumped out Teese twice because I despise the flavor and consistency. Here's to new cheeses! 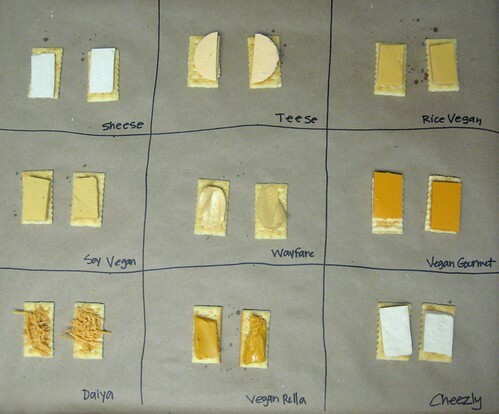 I am planning a little vegan "cheese" testing experiment myself now- yours looks like so much fun!